Places I've Eaten: CAFE CHAAT IN SOMA...INDIAN FOOD FOR EVERYONE! Usually when places have giant menus and pictures they plaster all over their windows, it can be a sign they are desperate for business and thus the food might be so-so, in Chaat's case, I'm gonna say it's neither. The place seems to be always open (11am-Midnight--7 days a week!) and during prime eating hours, I've notice a pretty full establishment. Me and the SO decided to actually eat in Saturday (middle of the afternoon) before said movie, to see if sit down service was any better than delivery. 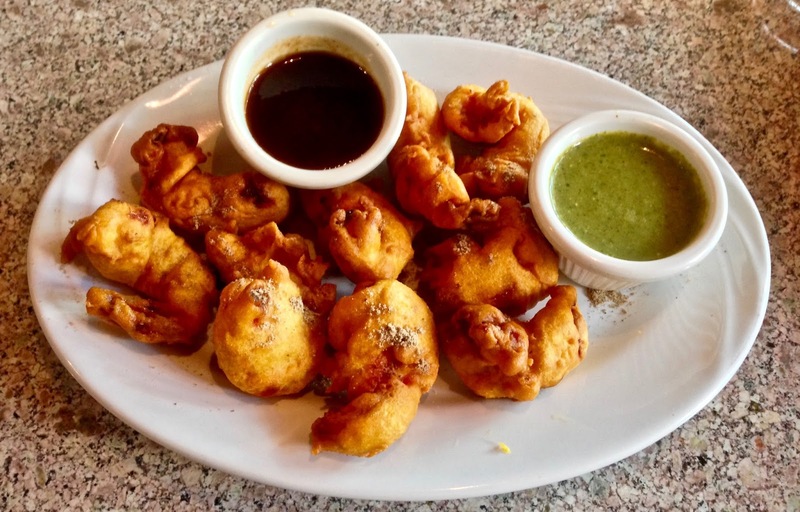 I'm a sucker for vegetable pakora, those neat little deep fried shapes of spinach, onions, cauliflower and mostly potato, dipped in a spicy batter. They are served with a green mint sauce and a dark brown spicy tamarind chutney. As an appetizer it runs about $5 and is totally worth it. You get a fair amount of large sized pakora that are fresh out of the fryer. Lightly crunchy on the outside, steaming and soft inside. I could almost make a meal of these themselves. The mint is a nice a cool dip to offset some of the heat and while it is good, mint is not my go to. I'm the biggest fan of the chutney. It's a slightly thick sweet and spicy dip that hits all the right notes for me personally. I usually ask for an extra as I will use it all. And while these are deep fried, they do at least veer on the healthy side as it is all vegetable and they are supposed to be good for you right? 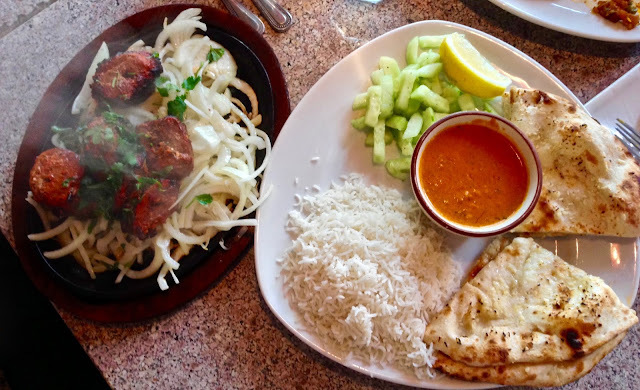 Our final dish was the tandoori cooked lamb boti kabob served on a hot place with onions and a side of Basmati rice, dal, garlic naan and I opted for the cucumber salad for $13.50. Tandoori meat can sometimes be hit or miss for me as while this is clay pot cooking, occasionally the meat can come out on the over done side, thus I feel I take a chance when I order it. Again, fan of lamb, and this time it was right on the edge of being just a tad dry. Some of the outer edges of the meat were a little too "blackened" for me but some pieces were spot on, thus a mixed bag when you only get 5 decent chunks of lamb. I do think it was overkill on the onions. There were so many, the hot plate was unable to sufficiently cook them all, so a little less would have been better. The had a great spicy kick that I like. I did keep thinking though I could have used some other type of sauce like a yogurt sauce or something to offset the spicy lamb, I think next time I'd probably ask for some of that tamarind chutney. 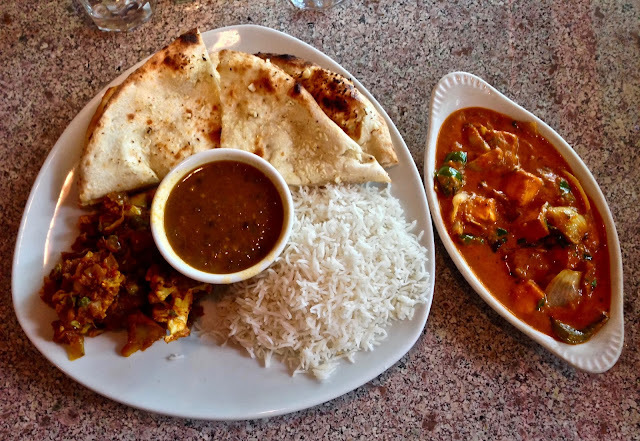 This was an okay dish, but I wasn't like, "ooohh,,,,best tandoori ever!" and would get something else next time around. The lamb is just one of many dishes they offer and while it wasn't my fave, they do many other things really well and this place is worth dropping by or at the very least, ordering delivery. Things to keep in mind, they place can get really busy particularly during weekday lunch and some weekend dinner times. Service here can also be spotty. We were there during a slow time of day and we still had to wave down our server a few times for drink refills. Could just be an aberration but just so you know. You also get plenty of food for the price and like us, you will have leftovers for another meal. Plus, it's one of those places that can meet all your groups needs like, vegan, gluten free, dairy free, whatever anyone may be on at the moment. They also do one of the cheapest lunch specials in town. 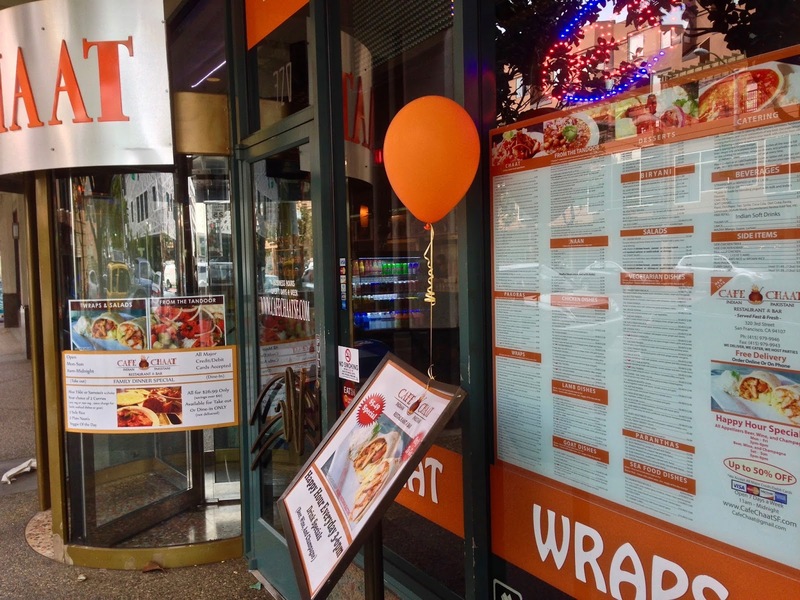 It's a different naan wrap each day with a side cucumber salad for $5. It's take out only but where else you gonna find that in SOMA? If you ever find yourself in the hood, they are worth checking out, whatever time of day you manage to get by.